Expect this winter to be snowier than usual, with two or three major storms. That's what Storm Team 4 chief meteorologist Doug Kammerer is calling for in this winter weather forecast. WASHINGTON — Expect this winter to be snowier than usual, with two or three major storms. That’s what Storm Team 4 chief meteorologist Doug Kammerer is calling for in this winter weather forecast. “Our average snowfall in the D.C. metro area is about 15 inches — out toward Dulles, a little bit over 20 inches — and I really do see us going about double that this year,” Kammerer said. 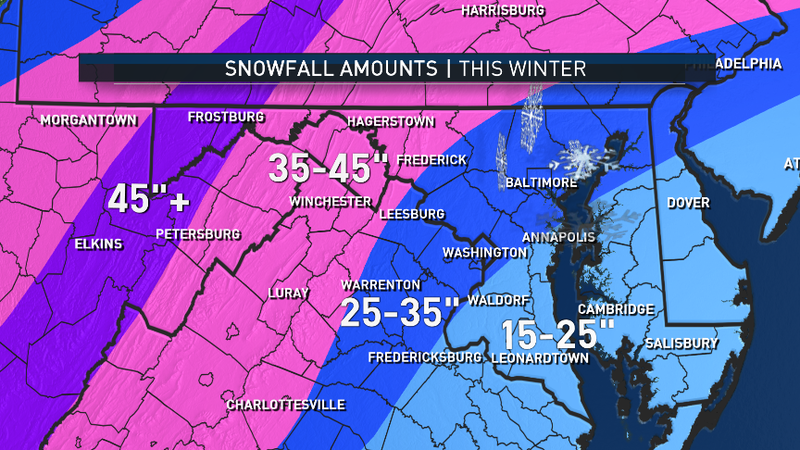 He’s predicting snowfall totals of 25 to 35 inches for much of the D.C. area, with a little more to the west, and slightly less to the south and east. But, don’t look for big snow until early next year, Kammerer said. “I think we’re going to get some pretty good rain here in the month of November. I don’t think we’ll get much as far as snowfall goes in December at all,” he said. So far this year, Reagan National Airport has recorded its sixth wettest year ever, and Kammerer predicts that will change. Once we reach early 2019, Kammerer thinks the region will get two or even three major storms that will each dump 6 to 12 inches of snow. “(In the) later portion of January, we’re talking the third or fourth week of January, we could have one to two storms in that time frame. And then, the last two weeks of February, one to two storms in that time frame, too,” he said. 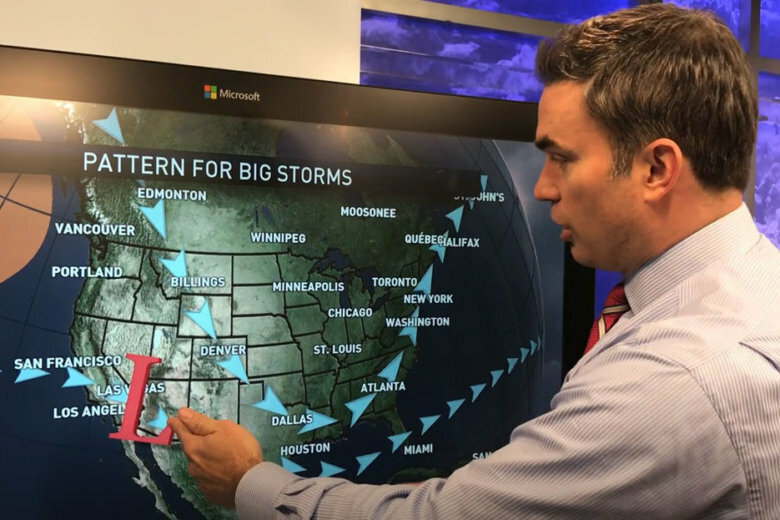 What goes into Kammerer’s forecast? “I look at things like Siberian snow cover, which has really ramped up over the past couple of weeks. I look at the solar cycles, which, right now, we’re going into a solar minimum, meaning less solar activity. In those years where we have very low solar activity, we tend to get a little bit more frequent snowfall,” he said. “And then, we look at something called the warm blob, which, as scientific as it sounds, has a huge place in the forecast for winter weather,” Kammerer added. So, what’s the warm blob, and why is it important? “The warm blob is an area of warm water south of Alaska in the Gulf of Alaska in the north Pacific, and that area of warmer-than-average sea surface temperatures really helps to produce a jet stream that is amplified in the West Coast, and allows cold air to come down from Canada into our area along the East Coast. And, if we can get that cold air to line up with the stronger jet, the southern jet from the El Nino, I think those two things coming together gives us a very good chance for a lot of snowstorms this winter,” he said. That would be quite a change from the winter of 2017-18. “Last year, we had the moderate La Nina, and that track was for fairly cold outbreaks, but it never really lined up with the snow. So that’s why last year we didn’t have much snow at all,” Kammerer said. “We had just one or two snowstorms, the biggest of which being in March. So, we really went through a fairly snow-free winter for the most part last year. This year, we’re really looking at winter to really ramp up in January and February,” he said.